When you spend over £200 (UK only). Crazy Eye Accessories are generally the most common of all used Fashion Eye Accessories. Used for costume parties, stag/hen weekends and for fancy dress parties. 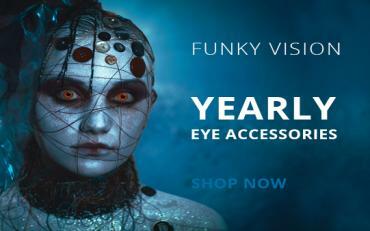 Halloween is the most popular time of the year for Crazy Eye Accessories where sales will literally quadruple so make sure you are well stocked up. © Copyright 2015 Funky Vision Limited. All rights reserved.